At the heart of the city centre, the Leela Palace is situated amidst seven acres of lush gardens and a sparkling lagoon in the garden city of Bangalore. An art-deco building its copper domes, arches and ornate ceilings reflect the grandeur of palaces of a bygone era. It is decorated ornately and with exquisite care, each priceless hand-woven carpets to brass antique, detailed crystal to the finest bone china has been discerningly hand-picked. It offers an experience of world class luxury. The hotel offers 254 modern, cozy and elegantly decorated rooms and suites classified as Executive Suite, Deluxe Suite, Deluxe Room, Conservatory Room, Royal Club, Turret Suite and Presidential Suite. The 3500 square foot Maharaja Suite, located on the 5th floor, offers panoramic views of the inner courtyard with lush gardens and the mist covered waterfalls. Some other facilities at this wonderful 5 star hotel are 24 hours room service, airport/station transfers, doctor on call, same day laundry, money changer, fax, e-mail, internet access, safe deposit lockers, baby sitting, valet, travel desk , hot/ cold running water, telephone with STD/ISD facility, mini bar, room safe, hair dryer, business centre, executive floor, beauty parlour, shopping arcade, health club, swimming pool and a spa. It has three famous restaurants, Citrus, Zen and Jamavar and the bar is simply called the Bar. Situated on 23, Airport Road in Bangalore it is 10 minutes from the city center, 7 minutes from the airport and 15 minutes from the shopping district. Sleek and stylish, this 5 star deluxe hotel provides every luxury to please the discerning traveller. 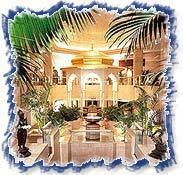 The hotel is spread over 20 acres of landscaped gardens and is a fine tribute to Bangalore, the garden city of India. Situated a mere 15 minute drive away from the business, entertainment, and shopping districts, it is near to the race course, golf course and the planetarium. The hotel offers 122 well furnished rooms and suites, providing world class modern amenities and facilities to please both business and leisure travellers alike. Amenities include internet connectivity in all rooms, in room fax, data ports for PCs and modems, 2 line speaker phone with international direct dial facility, minibar, personal safe, channel music, colour television with satellite programmes, 24 hour room service, laundry service, private verandahs overlooking lush gardens as well as complementary use of steam, sauna, jacuzzi, and gymnasium at the fitness centre for all guests. Some of the other facilities here are a swimming pool, fitness centre, travel desk, car rental, pastry shop, book shop, shopping arcade, currency exchange, safe deposit lockers, doctor on call and baby sitting, flood lit tennis court, arrangements for golf and horse riding on request. The Blue Ginger restaurant here is known for its authentic Vietnamese cuisine, Mynt is the 24 hour coffee shop and the Blue bar is the stylishly open air lounge bar here. India- a word in itself, nowhere else one can find such immense diversity, beauty, innocence and pleasures as in India. The varied art forms, traditions, culture, landscape are woven intricately into this delicate fabric of beauty. The country has an immense natural wealth that makes it a favorite tourist destination. From the snowy beauty of Kashmir to sandy beaches in Kanyakumari, India paints a true picture of heaven with diverse landscape. India is an ever demanding destination for people for centuries. India represents a kaleidoscope of color and festivals, perfumes and aromas, cuisine and costumes. India has all that one can wish for. The magnificent forts which dot the country and architectural marvels like Taj Mahal are the symbols of royal legacy. India is also a country of contrasts and paradoxes, of spectacular images and events of extreme patterns of behavior, and that is what makes India so irresistible and a powerful tourist destination. We at Top Tour and Travel (P) Ltd., established in 1985, to plan and develop holidays with special care to inculcate the spirit of India in every tour. We work meticulously to offer you unique and customized itineraries which will help you capture the heart and soul of a destination. We are one of the leading travel agents and tour operators in India and duly recognized and approved by the Ministry of Tourism, Govt. of India. We are also members of various prestigious national and international travel trade associations like PATA, IATO, TAAI, JATA, ASTA, USTOA and AFTA. The tour provided by us offers some of the loveliest destinations and some outstanding tour packages. You can choose a package or design one as per your requirements and desires. We assure you that travelling with us will be an experience of a lifetime where each place that you visit will be matchless. Culture, heritage, adventure, wildlife, pilgrimage, nature and other tours will be covered in our tour package which will excite you beyond imagination. We believe in presenting India in a way that is quite unique, unexplored and unhindered. Whatever you are looking for in India we can help you find it and whatever itinerary you may have in mind we can help you shape it. Our expertise, attention to detail, commitment to client and personal touch will enable you to enjoy every minute of your vacation to the fullest. We aim not only at providing excellent services but also at the realization of your dream package. Contact us and make India your next destination to carry memories to be cherished forever.